It's a holiday. I'm feeling lazy. Even though I have gifted this before, it was the closest book at hand, so here goes. 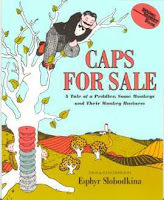 Caps For Sale. A nice, gently-loved paperback copy for The Great Monday Give. Leave a comment on this post before midnight, Sept. 13, Sunday to be entered to win. A winner will be selected randomly and announced the next day, Monday. Cool right? Last week's winner? Celeste is now the owner of her very own copy of The Philharmonic Gets Dressed. Shoot me a note with your info at webe(at)soon(dot)com. Cheers and happy labor day! I think I remember having this book read to me at the library as a kid. We haven't gotten this one from the library in a while, but it's a great one! Father and daughter both liked reading this one. This is one of my favorites of all time...I have a plush monkey wearing a cap on my desk at work. I haven't read this book, but I'd love to! Just found your blog...and love it!! Thanks for inspiring! My little one loves books already and I hope to help her passion grow! A perfect fall time read! I love this book. I've read it with both of my boys and would love a copy for our home library. This is one of my favorite books! I would love to have a copy! I loved reading this when I was little! I bet my little one would love it too! My son loves this book. I would love to win this for him. I love Caps for Sale! This was one of my favorite books when I was a wee, little girl in the 1960's. One of my favorite memories of this book is that Captain Kangaroo used to read it on TV. Fun, fun, fun! i remember this book fondly! :) too bad i missed out on it!